One of our current staples in home cooking is fried rice. Garlic fried rice, to be specific. It’s The Man’s favorite kind of fried rice, and it’s so easy that I never really tire of making it. Here is how I do it. Prep your old rice by taking it out of the fridge and having it go to almost room temperature. Cooking cold rice will just make the process much longer. Take a whole bulb of garlic (yes that’s how we roll!). Peel the cloves, wash the cloves briefly, then dice them. It’s your choice if you like finely diced garlic or just roughly diced. Heat about a couple of tablespoons of olive oil in your nonstick pan. Fry the garlic in the olive oil until it starts turning brown. Put in your old rice. For this much garlic I can use about two to three cups of old cooked rice. Use a spatula (or two, I like to double-wield) to break down the rice until the grains separate and gets coated by oil and garlic. 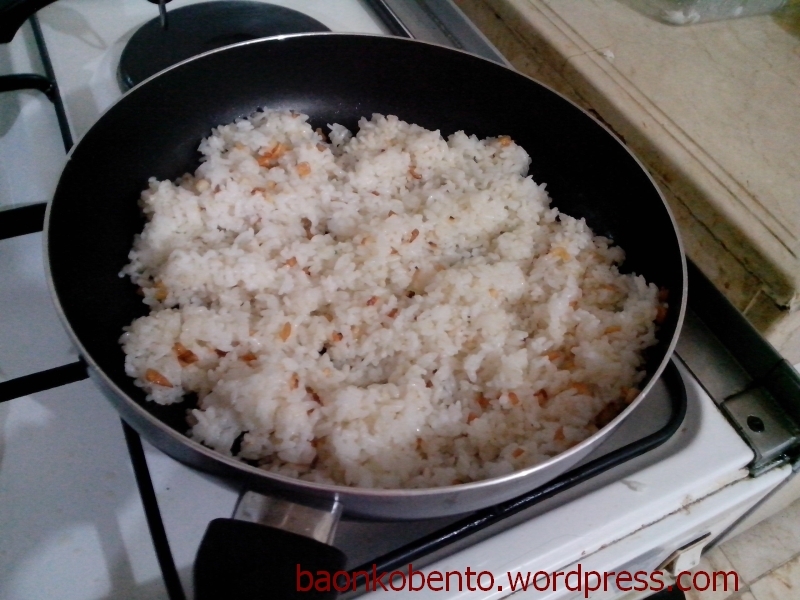 Be generous with your tossing around of the rice and garlic, to make an even mix. If you are using cold rice this can take a while. Sprinkle a bit of salt and pepper according to taste. I like to put only a shake or two of each, just to get a bit of flavor in. I don’t want to overwhelm the taste of the garlic. It’s hard to say when it’s done as I just eyeball it. Basically once the rice grains are separated and looks like it had a turn at the bottom of the pan, I stop cooking. The whole process shouldn’t take more than 20 minutes, unless you take a long time peeling and dicing the garlic. Take it off the heat and serve immediately. We usually serve this with smoked bangus or tocino, maybe a side of fried egg, and a tomato-and-patis salad.